Transportation costs can quickly eat into budgets that involve long haul shipments. As more businesses struggle to find long haul capacity due to the driver shortage, intermodal shipping is increasingly a viable option. There are many benefits to using intermodal shipping. However, there are also lingering hesitations that many shippers have. The general consensus over the years has been that rail services can't compete with over the road trucking. In some cases, this may be true, but for the most part this is a misconception. One of the biggest advantages of intermodal shipping is the pricing. From a cost perspective, rail solutions offer an economy of scale. Because they can move many containers and trailers at once, transportation costs are spread across multiple shippers. The difference in costs between rail and road can range from the hundreds to even thousands of dollars. Of course, the difference will depend on which lanes the shipper uses. As with long haul trucking, some rail lanes are in higher demand than others. Higher demand will lead to less savings in comparison, but in general there will be savings nonetheless. In a comparison of rates between rail and road service in January 2019, we found significant savings via intermodal shipping. Atlanta, GA to City of Industry, CA: Shipping by rail was estimated at $2,775 compared to $3,200 for over the road trucking ($425 in savings). Atlanta, GA to Tacoma, WA: Shipping by rail was estimated at $3,100 compared to $5,880 for over the road trucking ($2,780 in savings). Probably the biggest misconception of intermodal shipping is the speed of service. In the past, it would be safe to say that rail transit times couldn't compete with trucking. That has changed over the years though. Improvements to rail infrastructure and technology have drastically improved speed. In many lanes, intermodal shipping can match standard trucking transit times. Nonetheless, shippers should work closely with their service providers to ensure that crucial lead times will be met. Strategic planning can help shippers save both on time and money when shipping by rail. Intermodal shipping can offer a great amount of flexibility when it comes to distribution. In particular, rail services can improve pool distribution models. By shipping in volume by rail to a select market, cargo can be deconsolidated for regional less-than-truckload or full load distribution. The benefit is that the shipper can reduce their long haul costs by shipping via rail. 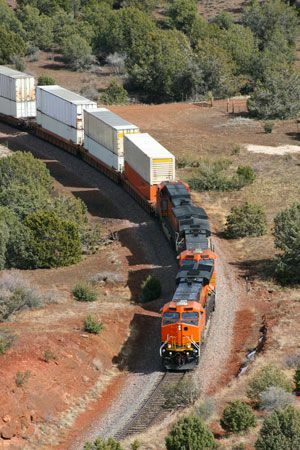 Another reason to consider intermodal shipping is that cargo can be transported by container or trailer. Ocean containers can be transported direct to or from many ports across the country. This can help reduce the costs associated with long haul drayage. Standard truck trailers can also be shipped by rail. This can streamline the pickup and delivery process and reduce overall lead times. This is a great strategy because transloading between a container and trailer isn't necessary for transportation. a driver can pick up the trailer at the rail yard and make a direct delivery within the same day in many cases. Many service providers can offer both container on flatcar or trailer on flatcar solutions. Work with your service provider to determine which option is best for your business.